Deliver training on STCW/BST, ISM, ISPS, MARPOL, VGP, MLC, SOLAS, and more. Our DVDs include memorable visuals and instructive graphics. We can direct you to specific titles or put together tailored packages. Quantity discounts available. Media player with on-demand video training and record-keeping. MTS On Demand is designed specifically for the maritime industry. Get every MTS training video in one place, create attendance records, and generate training reports. Easy to use, interactive, self-paced. Includes assessments and certificates. SCORM compliant. Purchase a CBT and add it to your Learning Management System (LMS). Can't find a training product that fits your needs? Tell us the topic and our experienced Custom Training Video team will create a video based on your needs, filmed at your location. Contact us for a quote today! 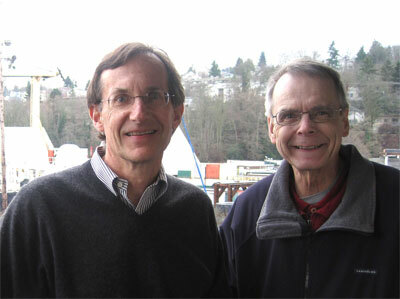 Maritime Training Services was founded in 1994 by Terry Bergman and Rick Titcomb. It was their vision to produce high-quality training tools to improve safety and understanding for mariners around the world. The two men will never forget a note they got 20 years ago describing the loss of a young sailor who fell overboard. Had the sailor been trained, had the crew been trained, the young man might have been saved. "I think about that often," says Titcomb. "One little piece of information may save a life. I'm very proud of the fact that we are bringing cultures together and adding safety to areas that may not have had it before." Before Maritime Training Services, Bergman had decades of training expertise helping small, independent oil companies comply with oil-pollution prevention and response regulations on the U.S. West Coast. He was working in the marine oil industry in California when the 1989 Exxon Valdez oil spill changed the world for mariners everywhere. Bergman watched as sea captains chose to bunker their ships elsewhere, rather than risk noncompliance with California's new oil spill regulations. Within a year, he was one of hundreds of people out of work as the number of oil suppliers around Los Angeles fell dramatically. That's how MTS's first training video was born, out of a meeting in Washington State, where Bergman was helping to develop new bunkering regulations. "It wasn't lost on me that there was enormous economic risk to the oil industry," he recalls. The regulations themselves weren't that onerous. Most were just good practices already followed by well-run shipping companies. Bergman wondered: Could he make a video that would both communicate the rules and reassure captains and crews? "I've often said that the regulations are written in English, but that doesn't mean that even a halfway-intelligent person can understand what they say," Bergman says. "We try to translate what people's responsibilities are for them." He enlisted the aid of Rick Titcomb, who'd been in the financial end of the marine oil industry, and used vetted information from the United States Coast Guard and the State of Washington. The resulting video, "Bunkering Operations," started a flood of requests for other videos - a vital connection with people in the seafaring community that still directs how MTS operates today. "People in the industry want to do the right thing, but it's expensive. People are driven to cut corners when they're trying to cut costs." MTS tries to help with that balance so companies can cut costs without losing safety "or their integrity." Sometimes, as with Exxon Valdez, the videos and DVDs are in direct response to a world event. By understanding how the USCG responded to that incident, MTS was able to quickly and meaningfully respond to 9/11, with a complete series of training programs on the new ISPS code. Other videos reinforce training for everyday safety needs, including fire drills and medical emergencies. More than a million seafarers are on deep sea ships. Shipping companies are asked to do more and more with cross-cultural crews while requiring higher technical skills. MTS videos are filmed on ships so that mariners instantly relate to the environment. Experts in the marine industry provide the information that MTS translates into understandable visuals and an increasing number of languages. Find out about new products and other offers.